All of our successes, and all of the things we're going to achieve together, are because of people like you, Robert, who step up when you can and do your part across the country. P.S. -- Your donation will automatically enter you for a chance to meet me in New York -- your flight and hotel are on us. Enter today, and I hope I get the chance to thank you in person for everything you do. No purchase, payment, or contribution necessary to enter or win. Contributing will not improve chances of winning. Void where prohibited. Entries must be received by 6/6/14. Enter by contributing here, or click here to enter without contributing. All entries received on 6/1/14 count as ten (10) entries. All entries received on 6/6/14 count twice. One (1) winner will receive the following prize package: round-trip tickets for winner and one guest from within the fifty U.S. States, DC, or Puerto Rico to New York, NY; two (2) nights hotel accommodations for winner and one guest; the opportunity for winner and winner's guest to attend a DNC event in New York, NY on 6/17/14 (approximate retail value of all prizes $3,000). Odds of winning depend on number of entries received. Promotion open only to U.S. citizens, or lawful permanent U.S. residents who are legal residents of 50 United States, District of Columbia and Puerto Rico and 18 or older (or age of majority under applicable law). Promotion subject to Official Rules and additional restrictions on eligibility. Sponsor: Democratic National Committee, 430 South Capitol Street SE, Washington, DC 20003. I need your help.. it should not take more than 5 minutes. On June 11th, we go before the York County Planning Commission. l hope you will write a letter in support of my Special Use Permit application to allow my oyster farmers to conduct some limited oyster farming activities on my land/piers. l can share plenty of restrictions l have placed on myself if you are interested. As you may already know, my "favorite neighbor", Tim McCulloch is on the Planning Commission & has spent the last 4 years doing everything possible to shut down our oyster farm, even though he started his own commercial oyster farm right next door to himself (which l fully support) 2 years ago. The Bay and 3 guys with jobs (one part-time) are counting on this SUP. Plus this is a groundbreaking property rights issue. l need to counter the distortions which keep coming, like the one below. Please help. l will get copies of your letters/emails. Send them to Tim Cross at tcross@yorkcounty.gov & BCC me if you can. Please read this letter in response to 2 misleading letters(BELOW) from Maria Tiller who lives on Sandbox Lane. I fully respect your right to express your opinion.... but l do wish to set the record straight. You refer to our home as being "next door" or in another letter, "adjacent to your home:", Our home is at least 700 ft from your home. Our river dock is at least 700 ft from your dock. Our cove dock is at least 400 ft from your home and your property is not adjacent to our property. I do not think referring to us as being next door is fair or honest. You are growing oysters in the cove & at your dock... so at least you like oysters & oyster growing. That is a good thing, some common ground that we should be able to build upon. Was it really one of your tenants that falsely accused us at the May Planning Commission Meeting of having a "20 fold increase in workers at our oyster farm in the 3 years that he has lived in one of your apartments"? Three years ago, we had 1 or 2 oyster farmers. Today we have 1 or 2 or 3....maybe a 50% increase, not a 2000% increase. You have complained that Sandbox Ln goes approx 25 ft from your bedroom. l suspect it is closer to 40 ft, but if we enforced our easement, it would be about 10-15 ft from your bedroom. 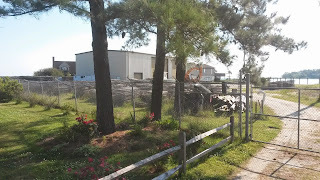 The stripped parking lot for your apartment house is on the 50 ft easement to our property and we could legally have you remove the parking lot which might mean that you would lose some of your tenants if they do not have a place to park... but we have done nothing about it. We have no desire for you to lose the income from your rental business. ln the 10 years we have been living here we have never complained about you having your "residential home" cut up in separate apartments and renting to different tenants. We trust that if you rent to them that they are good people that would never harm my family. I wish you would give us the same courtesy and not refer to our farmers as "strange people". They may not have an education equal to you & CT, but neither do I.
CT spoke into the camera to WVEC News 2 weeks ago and said that "the noise from our power-washer is unbearable". You know that was an unfair statement, especially since we haven't even used it for 2 or 3 months. Our farmers have been using a garden hose which is silent especially 400 ft away. When we did use the power-washer it was used over 400 ft from your home and has a much smaller engine (only 7 HP) than your own lawnmower. You might remember when our dock was built many years ago that the power-washer was louder, since it had a 180 HP motor. You stated that "all oyster farm activity takes place directly in your view of the water" & that the oyster farm activity is "right in front of you" & that the "oyster activities have replaced the views you used to enjoy". You know this is not true. You are only on the York River, not adjacent to the cove. We are not in front of your home in the river, but mainly 400 ft away to the east in the same cove where you are growing oysters. The oyster farmers are not even in the river more than an average of 1 hour a day, but when they are they are at least 300-600 ft away from your home. You have wide open, uninterrupted views of the river to the north, northwest, and northeast. You can see the sun come up every morning and go down every evening. How can you make these outlandish statements? Considering that you only have water on the north side of your lot, you have incredible views. Perhaps if you were to change the direction of your zoom lens camera to face north/northest or northwest you would see endless, beautiful water, sunsets, sunrises, dolphins, pelicans, osprey, seagulls etc. 8. Your statement that "there are 2 to 4 vehicles entering or exiting the lane virtually every hour" is simply untrue. But most people would love to only have an average of 3 vehicles pass their home every hour. I suspect that Dandy Loop Rd has about 40 to 60 vehicles every hour to pass by. 9. I wish you and CT would talk to me about what we are actually going to do if the SUP is approved. h. do you have any other suggestion that we could incorporate? In other words, the SUP will be much better for you. As you probably know, we have all the approvals from the Commonwealth of Va to legally conduct our oyster farm over the water & are commited to doing so (without any County oversite of regulation) if the SUP is denied.... which due to storms and winds, means it will be primarily in the cove.... So moving it to our land should be much better for you & CT.
Cc: Hrichak, George; Noll, Sheila S.; Shepperd, Thomas; Wiggins, Don; Zaremba, Walter C.
My name is Maria Tiller and I live at 115 Sandbox Lane in Dandy. My home is on the same private residential lane as a commercial oyster operation. I truly appreciate this opportunity to explain to you how this has negatively impacted my family as you consider the options before you that I hope will serve to fairly and equitably protect the property rights of ALL York County residents. My husband has owned our home since 1972. I have lived there with him since we married over 18 years ago. Together we believe in tradition- in the tradition of the old Virginia watermen and of neighbors caring for one another. We are saddened to be here today, asking for your help, for the County's protection, in helping preserve the peaceful character of our home and neighborhood for the last 42 years. The commercial oyster operation on the residential property next door impacts our enjoyment of our property every single day. First, all activity takes place directly in our view of the water. The oyster operation is right in front of us as all activity is on the cove and river between us and not on the Thorofare. Commercial oyster activities have replaced the views we used to enjoy. Our property sits on a private lane shared by 4 other homes, a unique attribute of our property. We are the next to last house with this neighbor being the last. He is the fourth owner of his home in the last 18 years but the first to treat the private drive we all share as a commercial public thoroughfare. On most days, there are two to four vehicles, mostly trucks, entering and exiting his property virtually every hour. The private drive, situated a mere 25 ft from our bedroom, is no longer very private at all. Activity takes place up to seven days a week, often beginning before dawn and continuing until after dusk. There are two to four employees on site without supervision. My neighbor may speak to them in the morning on his way to work and again when he returns in the evening but neither he, his wife, nor his adult son who lives with him participate in the day to day work involved in the oyster operation and/or exercise oversight of the workmen. And, yes of course, workmen, trucks, pressure washing, sorting, packing, boxing, loading, etc, all create the noise and disruption you would expect. As bad as it is now, any increase in the size of this commercial activity would only worsen the situation. And so I am here before you, asking for your help in protecting us from the adverse impacts that we are currently experiencing and will worsen if commercial aquaculture were to be allowed without restriction in our residential neighborhood. We defer to your judgment on whether this is best accomplished through the definitional changes in option A, the rezoning in option B, or the establishment of performance standards in option C. If however, you accept the staff recommendation for option C, we respectfully ask that you consider additional standards necessary to protect everyone's property rights. We now have the benefit of four years experience with a commercial operation taking place next door to us. We would ask that you consider adding standards related to the size of the operation with regard to the residential nature of the surrounding properties so that it is proportionate to the setting in which it takes place. Standards related to size and scope of the operation should address, for example, the number of employees, full and part time, parking for employee's vehicles, a reasonable limitation on days and hours of operation including limits on the use of outdoor lighting, the number and size of workboats, and the number of vehicles entering and exiting the residential property in a given day and also, importantly, how it would be monitored for compliance. We would ask that the standards address placement of the operation and require the property owner to place the operation in the location that minimizes the impact on neighbors. For example, in my neighbors situation, any oyster operations should take place on the side of his property that faces the Thorofare and not any of his neighbors. Additionally, we ask that the standards related to storage of equipment require all equipment be stored in a properly landscaped shed and not merely behind fences and shrubs, or in trailers, so as to accommodate neighbors with multi story homes. In conclusion, I strongly urge the Planning Commission and York County to take action to protect the rights of all property owners. Thank you for your consideration of these matters. I sent the York County Planning Commission and Board of Supervisors an email describing how our residential quality of life has been destroyed by the commercial oyster operation being conducted from the Garrett residence adjacent to our home in Dandy. As they say a picture is worth a thousand words so here are a few pictures showing just a little of what we have faced almost everyday of the past 3+ years. We have read and seen the media distortions of how quiet, peaceful, and pristine this operation is. Please note the dates on these pictures- they begin in mid-April 2014 and continue through early May 2014. What you see presently and on TV and in the news and on websites is all "make-up, cover-up". There are hundreds more of these pictures taken over several years. Please do not buy-in to the propaganda rampant in the media. Protect our residential quality of life we have enjoyed here since 1972. FYI - Our house went under contract over the weekend … Things are moving sooner than we thought. So if you can pack a box, move a dresser or such PLEASE call 867-6336 and let us know If you could help Saturday and / or Sunday to load a trailer. · Anyone who would like a great deal on a 1849 piano .. please let us know .. we’d like it to go to a good home. We just don’t have the room for it. · I’m planning on my last work day as 7/31 and 8/1 as retired! FYI - I’ll be staying with a friend while in transition. · PS I plan on hanging out my shingle … Hartel and Associates, LLC … my cell will remain the same. Democrats have a good shot at winning some critical races this November, and we have a fighting chance in some places you might not expect our party to be competitive. That's good news for you, me, and Barack -- but it also means that Republicans and their allies will be putting their resources into snuffing out our chances. You know what I mean by their resources: Lots, and lots -- and lots -- of money. We can't match them dollar-for-dollar, but we know there are other -- and better -- ways to win. Before Saturday's deadline, we need just 23 people from Yorktown to step up and chip in what you can to help build our grassroots base. Will you be one of them? We're in a critical fight, and we need to be smart about how we take on the Republicans. That's why it's so important to get a strong showing of support in every city across the country -- and you can help in Yorktown. From both me and Barack: Thanks for your commitment and support, Robert. We're in this together. P.S. -- Don't miss out on this: Donate today, and you'll be automatically entered to win a free trip to New York to meet Barack. If you win, the Democrats will be picking up your hotel and airfare. O.A.R. & Phillip Phillips at nTelos Wireless and More Unique Things to Do!